This manor towers above the streets of Skingrad. 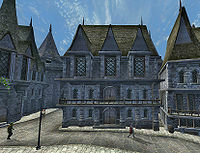 Rosethorn Hall is a house for sale in the northern part of Skingrad. It is the biggest and most expensive house (available for purchase) in Cyrodiil. Rosethorn Hall is at first occupied by Vandorallen Trebatius, but he is "evicted" when the house is purchased from Shum gro-Yarug for 25,000 gold. A total of fifteen upgrades can be purchased from Gunder for varying prices. A housekeeper is available for hire upon purchase of the servants quarters upgrade. The upper wall hangings upgrade can be stolen from a table in the Surilie Brothers' house. The building is divided into three cells: Rosethorn Hall, Rosethorn Hall Top Floor, and Rosethorn Hall Basement. The main entrance of Rosethorn Hall is bare with a fireplace facing the door and two doorways on each side; the doorway in the southwest corner leads to the basement. With the sitting area upgrade, two stools are placed in front of the fireplace with a table between them that holds a silver glass and two silver goblets. A bench sits between the doorways on the east wall and there is an empty bookshelf on the west wall. Two new rugs can be found on the floor. The lower wall hangings upgrade adds two paintings and a tapestry to the walls. Both doors on the east wall lead into a small dining room with only a table and a chair. The dining area upgrade adds three more chairs around the table, which will have four place settings along with two loaves of bread and five strawberries. A pumpkin sits on top of the bookshelf on the south wall. A new rug and chandelier are also added to the room. The kitchen area upgrade adds a cupboard with drinks on the south wall and a cupboard on the north wall containing food. Additionally, there is a chest containing clutter and minor loot and a barrel on the other side of it containing more food. The table next to the barrel holds a cheese wheel and a cheese wedge. The display case upgrade adds two empty display cases on the wall between the doorways, and the lower wall hangings upgrade adds three paintings and three tapestries. The doorway in the northwest corner of the entrance hall leads into a small landing with a set of stairs leading to the second floor. The den area upgrade adds a desk and chair as well as two chests of drawers, all of which contain clutter along with the possibility of a common book in the desk. A new rug lies on the floor. The lower wall hangings upgrade adds three paintings and a tapestry at the first landing of the stairs, while the display case upgrade adds a large display case at the foot of the stairs. The stairs lead up into a bare balcony area with another set of stairs on the west wall leading up to the bedroom. The balcony area upgrade adds a clutter chest on the north wall and a small table with two stools next to the stairs, as well as a chair beside the post and two rugs. The balcony upgrade also adds two large bookshelves on the wall opposite the top of the stairs. The shelves holds assorted silverware and pottery and a small chest with a chance of a lockpick and/or a torch. The upper hall area upgrade adds a table and two chairs in the northeast alcove, as well as a bookshelf and two clutter chests. A new rug is also added to this area. The upper wall hangings upgrade adds two paintings to the walls and the display case upgrade adds two small display cases to the north wall. The entrance to the top floor of Rosethorn Hall is in the southeast corner of a large bedroom with a double bed on the east wall. A Long Forgotten Note can be found on top of the door area. The bedroom area upgrade adds two clothing cupboards and a bookshelf to the east wall, a clutter chest and chest of drawers on the south wall, and a stool next to the bed. It also upgrades the bed coverings and adds a large rug under the bed. The upper sitting area upgrade adds two stools in front of the fireplace, a table with a loaf of bread and two tomatoes and two chairs on the north wall, and a chandelier over the stools. The study area upgrade adds a large executive desk on the west wall with a chair and two mini-tapestries over it, as well as two bookshelves and a clutter chest in the northwest alcove. The display case upgrade adds two large display cases to the north wall, and the upper wall hangings upgrade adds six tapestries and five paintings to the walls. The entrance to the basement leads down a set of stairs to a large room with only a bare table on the east wall and a broom leaning against the west wall beside the stairs. Clusters of garlic hang from the post beneath an hourglass. The storage area upgrade adds a bookshelf, a clutter chest, and two clutter crates to the south wall and two food barrels and a clutter chest in the southwest corner. A clutter chest, two food barrels, and two wine racks which hold three bottles of Surilie Brothers Wine can be found on the north wall. Finally, a stool and two clutter crates are added in the northwest corner in addition to another stool beside the post. The servants quarters upgrade adds a privacy screen, a single bed and a cupboard with clothing beside it, a table with two stools, and a clutter chest in the northeast corner. Entering Rosethorn Hall via the upstairs balcony door counts as trespassing. However, since the door is hard to see from the street below, there is little chance of a bounty. You are still able to enter the house properly via the ground floor entrance. You can fix this by using the console: select the door and type setownership. If you sit on the stool in the basement (the one below the Garlic Clusters), you will be unable to get up again and will have to fast travel to any location in order to move on. The cause of the problem is that when you try stand up using the activate key, you inevitably activate the overhanging Garlic Clusters instead, preventing the standing action from being triggered. You can fix this by using the console from third person view: select the stool and type activate. Alternatively, this can be fixed by using the console to disable the garlic cluster: select the cluster and type disable. This page was last modified on 7 January 2017, at 23:11.